The term ‘briefcase’ originates from when lawyers used them to transport their documents – or brief documents – to court with them. These days, briefcases are large enough to safely store a laptop, important work files, stationary and even a packed lunch or travelling gear if your job involves a bit of jet-setting. 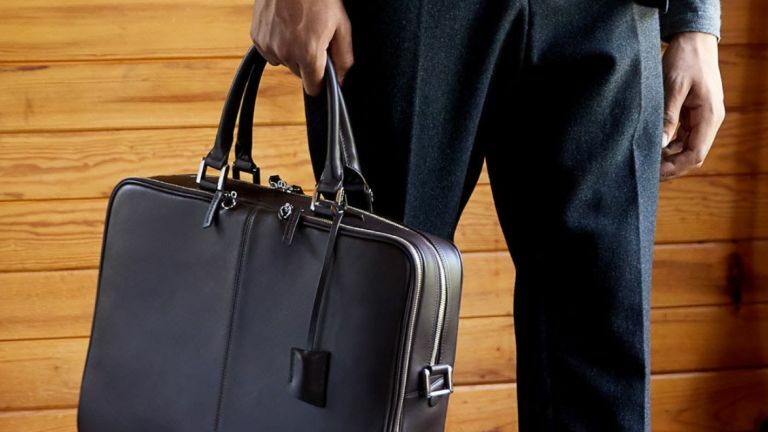 While there are certain requirements for the internal design of a briefcase, there’s definitely some style freedom when it comes to its external appearance. The design you are probably most aware of is the attache case. These hard, boxy cases with a single hinged handle and twin latches with combination locks offer a classic look, but could look out of place if you don’t wear a suit for the 9-5. Thankfully, there are many alternatives for those who need a briefcase but don’t work in law or finance. These come from fashion and high street brands alike, and often include storage for a laptop, plus documents and accessories of various shapes and sizes. Our list features a range of the best briefcases - from black and brown leather to black and metal attache cases - so you should have no trouble finding one to suit your budget, job and workplace. This briefcase is rather posh, with it’s cobalt blue suede interior, wooden frame and external calf leather finish. Aspinal of London boasts about the level of craftsmanship and attention to detail that has gone into creating this briefcase, which makes us think the price is justified. The case features a pouch for your laptop, pen holders, business card holders and a section to store important files or meeting notes. There’s even a lock on the outside, perfect if you happen to be transporting the UK’s nuclear codes. This compact briefcase by Ralph Lauren features a detachable strap for wearing over the shoulder, and includes a matching leather luggage tag. Inside, there is a dedicated sleeve for safely storing your laptop, plus two other pockets. The pebble grain finish of the leather should help protect the bag against scratches and scuffing. Made from polyurethane instead of leather, this briefcase by Ted Baker features dual contrasting handles, plus a detachable shoulder strap. A pair of zippers open the entire top half of the bag, making it easy to slip a laptop, tablet or documents inside. This compact leather briefcase has a neat buckle fastener and an attractive cotton lining. Inside, there are three interior pockets; one zipped, one for housing a tablet, and one slip pocket. There is also another slip pocket in the flap and one in the rear, giving plenty of storage space. This executive briefcase is kind of a hybrid of our first two picks. It’s slightly more rigid than the parker but not as highflying as the wooden, leather bound briefcase, which could make it the ideal choice for, well… executives. It features three internal main pockets, including one for a laptop and one for business documents. Thanks to the crocodile skin finish, it’s more of a fashion piece than the others, too, making it the perfect accessory to a well cut suit and polished shoes. Probably the most casual briefcase in our list, you can dress this one up or down. It has a light tan soft leather exterior, which gives it that relaxed appearance. It’s all business inside, though, with a laptop pocket, and a couple of compartments for work documents and various work necessities. There’s a front pocket for slipping in bits and bobs that require easy access and a shoulder strap for convenient wear – perfect if you’re a commuter. You can even detach the strap once you’re in the office for a smarter approach to carrying your work gear. If you’re looking for a briefcase that’s a little more streamlined, this laptop bag style item could be the one. It’s got a smart external appearance which features a synthetic black material contrasting against leather buckles and straps, which keeps it smart yet casual at the same time. The designers have given the wearer the option to open the whole bag to access their laptop or they can just open the top part if they want to access documents from the external pocket inside. The shoulder strap is removable, too, great for transitioning between on the go and being in and out of meetings. This James Bond-esqe attache case is the one that hides the weapons. Or just your laptop and a couple of pens. Even so, the aluminium exterior should look pretty cool and it’s all padded and secure inside so you can be confident things won’t get broken or go awol. With compartments to put pens, business cards, notepads and even you charger, this is great one for those who feel utmost satisfaction in seeing everything orderly. The case features two exterior locks for complete security, so you can be confident that no one’s going to slip it open and steal those important documents. If you fancy yourself an attache suitcase but can’t afford to let go of the equivalent of a month’s rent, this leather look suitcase may take your fancy. Yes, it lacks the finesse of Aspinal of London, but it does everything you need it to, including looking smart and featuring handy places to pop pens, business cards and notepads. The interior is also large enough to fit a substantially sized laptop and there’s two locks for keeping all of your work gear safe. If you’re rising through the ranks and looking to impress, you can’t really go wrong with this one – and the price won’t break the bank, too. This parker briefcase is professional without being over the top, which makes us think it’s the ideal bag for the everyday office worker. It’s made from a dark brown leather and features several inside pockets for laptops, work documents and even a padded pocket for a tablet- ideal for working men on the go. Thanks to the shoulder strap, you can wear this briefcase bag securely, even when running for the train and if you want to quickly access your phone or wallet, there’s a zipped external pocket, too. This classic attache briefcase features a three-digit locking system for each of its two latches, keeping your documents safe. Input your code (which can be set to whatever you like) and pop the latches to reveal a large storage space with pockets and sleeves of various sizes. There is space for documents and a laptop or tablet, plus smaller pockets for business cards, pens and accessories. Four metal feet protect the leather when rested on the ground, while the pig skin lining ensures no damage will come to whatever you store inside.